On December 5, 2018 the Dieter Senghaas Lecture will take place in the Olbers-Saal at the Haus der Wissenschaft (7 pm). The lecture entitled "Postnational Imperialism? A militaristic tradition of thought and its present meaning" will be held by Prof. Dr. Dr. h.c. Hans Joas. At the center of this fourth Senghaas Lecture is the European unification process, the legitimacy of which is anchored to a considerable degree in the successful establishment of a stable "post-Hobbesian" peace order after the Second World War. In today's efforts towards a common European defense and security policy, the decisive question therefore arises as to whether this will follow the principles that apply in Europe's internal relations or whether we are witnesses of the emergence of a new world power of an old school manner, i.e. a "post-national imperialism". This question will be explored in the lecture on the way to the present by Otto Hintze and Carl Schmitt in their examination of historical-sociological reflections on Europe. 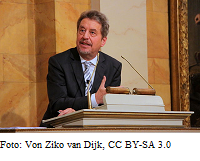 Hans Joas is Ernst Troeltsch Honorary Professor at the Humboldt University in Berlin. Before that, he was Professor of Sociology at the University of Erlangen-Nuremberg and at the Free University of Berlin. He was professor at the University of Chicago and between 2002 and 2011 director of the Max Weber College for Cultural and Social Studies in Erfurt and until 2014 permanent fellow at the Freiburg Institute of Advanced Studies. He has also received numerous awards, including the Max Planck Research Award (2015), the Alexander von Humboldt Foundation's Werner Heisenberg Medal (2012), and the Bielefeld Science Award (2010). 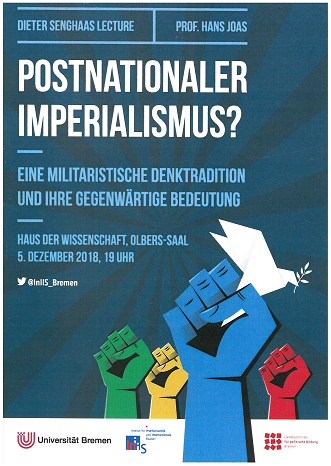 With this lecture series, the Institute for Intercultural and International Studies (InIIS) and the Landeszentrale für Politische Bildung Bremen are honoring the life and work of one of the most internationally renowned and respected peace and conflict researcher, who has been teaching and researching at the University of Bremen since 1978. In the book "Deutsche Politikwissenschaftler - Werk und Wirkung", edited by Eckhard Jesse and Sebastian Liebold, Dieter Senghaas is characterized as an outstanding scholar who has "shaped an entire generation of people in peace research, in the peace movement and in the developmental 'environment'. 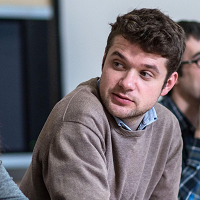 And it goes on to say: "Where Senghaas is, there is academy; there is a lively exchange about the changes in the world and about the dynamics inherent in it". With the "civilizing hexagon" he developed, which emphasizes the possibilities of peaceful development in and between societies, he has created a paradigm that has made it into the Abitur tasks of German students and into the most important textbooks of international relations. His book "Zivilisierung wider Willen" ("Civilization Against Will") on the long and difficult process of sustainable peace-building in Europe has been translated into numerous languages, including Chinese, Arabic and Korean. His oeuvre includes 35 books written by him as well as 35 other books in which he was involved as editor or co-author. Demokratien leben von der gelingenden Verständigung über kontroverse Themen und zwischen Konfliktparteien. In den letzten Jahren scheint diese jedoch immer schwieriger geworden zu sein. Einerseits haben ökonomische Ungleichheiten in Deutschland deutlich zugenommen, und mit ihnen auch die lebensweltlichen Unterschiede und Distanzen zwischen Arm und Reich. Gleichzeitig brechen Wertekonflikte auf, die an die Grundlagen identitärer Selbstverständnisse reichen und daher oft hochemotional diskutiert werden. 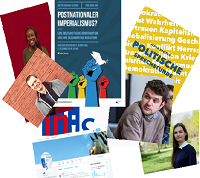 Der öffentliche, zivilgesellschaftliche wie politische Diskurs, der hier gefragt wäre, wird vielmehr selbst grundlegend in Frage gestellt als hegemonialer Diskurs von Eliten und bestimmten sozialen Milieus, die sich von den Lebenslagen und Lebenswelten der weite Bevölkerungsteile längst entkoppelt hätten. Wie kann Verständigung noch gelingen angesichts von gravierenden Ungleichheiten und Konflikten? - What are the different ways in which conflict-affected communities experience gendered harms and vulnerabilities, both during war and in post-conflict transitions? - How must the empirical and conceptual relationships between gender, victimhood vulnerabilities and/or agency be understood? - What conceptualizations of gender and victimhood can yield a more productive debate about survivors' experiences of harms? - How do survivors and war-affected communities exercise varying forms of agency to engage with their gendered conflict-related experiences? We invite paper proposals from early career researchers (PhDs and Post-Docs) across various disciplines. In-depth case study analyses alongside theoretical explorations and empirically-grounded papers are welcome. The workshop will be interactive and participatory; participants are expected to present a research paper on the theme of the workshop, but will also be assigned another paper for discussion, and are expected to actively contribute to the discussion throughout the workshop. If you would like to propose a paper, please submit an abstract of max. 250 words and a short academic bio by 15 November 2018 to Dr. Caterina Bonora (bonora@uni-bremen.de) and Dr. Philipp Schulz (pschulz@uni-bremen.de). There is no participation fee. The award-winning article can be accessed here, and the announcement by the Conflict Research Society can be found here. 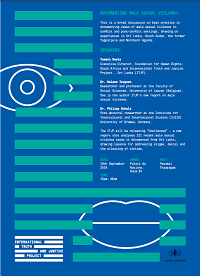 This is a broad discussion on best practice in documenting cases of male sexual violence in conflict and post-conflict settings, drawing on experiences in Sri Lanka, South Sudan, the former Yugoslavia and Northern Uganda. Project - Sri Lanka (ITJP). Social Sciences, University of Leuven (Belgium). Post-doctoral researcher at the Institute for Intercultural and International Studies (InIIS) University of Bremen, Germany. Warum gibt es in der Türkei keine Demokratie? The fact that, in view of the recent political dynamics, it is no longer possible to speak of an existing Turkish democracy is no longer a controversial statement. However, it is unclear why no democratic forces could be mobilized against the new Turkish autocracy. This article answers this question with reference to more recent democratic theoretical findings. These include the importance of factors such as religion, history, civil society and violence and ultimately contribute to very negative assessments of the quality of Turkish political institutions. Roy Karadag has been working on the developments in Turkey for a long time. A selection of his radio and newspaper contributions can be found here. The event takes place within the framework of the Maritime Woche an der Weser statt. Latest news always on InIIS Twitter. An old concern returns: Do we lose respect and contact with the truth in the "western" democracies? The current debates about the "postfactual age", about "alternative facts" or "fake news" are largely driven by the notion that our democracies need truth for their good functioning, and by the fear that they are at the same time particularly susceptible to the loss of truth. In doing so, they place the relationship between democracy and truth at the centre of the current debates on our societies' self-understanding. However, the media discussions are based almost unanimously on the unquestioned matter-of-fact nature of such a relationship - and thus stand in sharp contrast to the discussion in political theory, in which the necessity for, or even the existence of truth in democracy is by no means taken for granted. On the contrary, the relationship between democracy and truth is radically controversial: Thus, one can doubt with Plato that there can be truth in democracy at all, with Hannah Arendt warn against the tyranny of the truth of truth in democracy, with Jürgen Habermas assigning a role to democracy itself in the discovery of truth, or with Michel Foucault highlighting the function of pronouncing unembellished truths for democracy. Each of these alternatives - which far from exhausting the debate - assumes a different relationship between truth and democracy and assesses it differently. But it is not only the relationship between democracy and truth and its evaluation that is usually depicted in the current debate in a shortened form, but also the forms of truth and untruth in democracy are not considered in a differentiated way. It plays a major role here, for example, whether we talk about lies, propaganda or ideology, about apodictic evidence, logical truths or fallible attributions of knowledge. The same is true for to ask what influence different media have on the different forms of truth or falsehood in democracy: Are deliberately fabricated "fake news" in the social media really something fundamentally new, for example in relation to strictly aligned party newspapers? Do speed and range actually change the effect of real or alternative facts? What role does truth play in democracy - and what role does it play in democratic theory? What is the function of truth in democratic practices, and what place do epistemological considerations occupy in political theories? May, can or must democracy be epistemically justified? What significance does truth have for criticism in and of democracy? What is the relationship between truth and democracy in terms of the history of ideas? What is the relationship between truth and democracy and ideology theories? By focusing at the same time on the forms of truth in democracy, we also aim to stimulate contributions to the development of democracy. Cf. in sequence Platon: Politeia, in: Sämtliche Werke, hrsg. von Ursula Wolf, übers. von Friedrich Schleiermacher, Reinbek bei Hamburg 2011, Buch VIII; Arendt, Hannah: »Wahrheit und Politik«, in: dies. : Wahrheit und Lüge in der Politik. Zwei Essays, München 1972, S. 44–92; Habermas, Jürgen: »Hat die Demokratie noch eine epistemische Dimension? Empirische Forschung und normative Theorie«, in: ders. : Ach, Europa. Kleine politische Schriften XI, Frankfurt a. M. 2008, S. 138–191; Foucault, Michel: Der Mut zur Wahrheit. Die Regierung des Selbst und der anderen II. Vorlesung am Collège de France 1983/84, übers. von Jürgen Schröder, Berlin 2010. Please register briefly with Prof. Martin Nonhoff for the workshop. 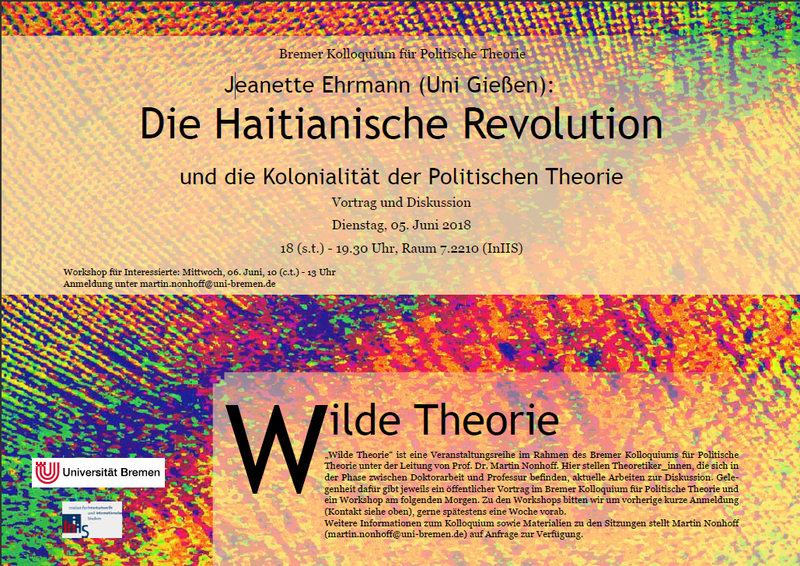 Wilde Theorie is a series of events within the framework of the Bremen Colloquium for Political Theory under the direction of Prof. Dr. Martin Nonhoff. Here, theorists in the phase between doctoral thesis and professorship present their current work for discussion. 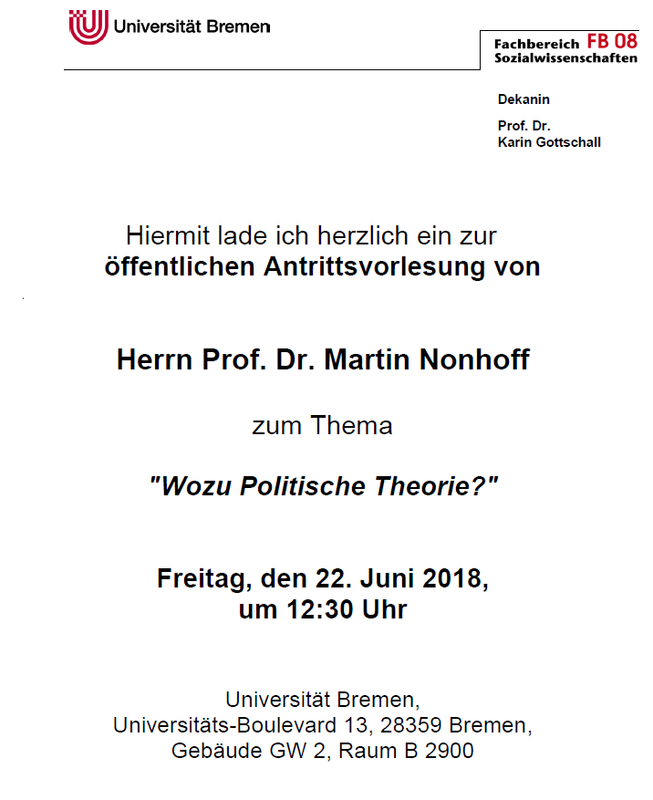 A public lecture at the Bremen Colloquium for Political Theory and a workshop the following morning will provide the opportunity to do so. Please register for the workshops at least one week in advance. Further information on the colloquium and materials on the meetings are available on request from Martin Nonhoff (martin.nonhoff@uni-bremen.de). The event poster as PDF.